The Wine Brandy Factory of Hoktemberian that after privatization in 1995 was renamed to MAP OJSC and from 2001 to MAP CJSC, was founded 1924-44, in the village of Lenughi. Now the factory is well equipped with modern winemaking machinery, various high capacities, French, Cyprian and Bulgarian tuns, German butts, reinforced concrete tanks and highly qualified specialists. Due to all this, MAP has become one of the leading companies in Armenia that can produce up to 14 million litres of first-class alcohol drink anuually. The entire cycle of wine and brandy production (receiving grapes, processing, ethyl alcohol distillation, ageing in oak casks in wine-cellars, brandy blending and bottling) is carried out by a classic technology. MAP is leaded by the motto – quality – first of all. The aim of the company was to use local wine base (Kharji, Voskehat, Garan Dmak, Rkatsiteli grape varieties) sorts. Later other grape sorts brought from the other regions of Armenia and Georgia, like Mskhali, Kakhet, Areni, as well as various new sorts produced in the result of interbeeding, such as Nerkeni, Tigrani, Muscadine Yerevanian and many others. A few months after the privatization of the company, canning foundation was laid in the factory. Within the same year the factory began producing goods with the brand mark “Arame” (the first King of Urartu – one of the vineyards of viniculture). Nowadays, MAP products can be found in all the corners of Armenia, as well as abroad. With the volume and quantity of its products, the company has become one of the standard bearers of our republic. Today the driving motive of MAP’s luck is innovations and unexpected ideas. The first capital of Armenia. Located on the left bank of the Araks River in the Ararat valley. Armavir was a major economic and cultural center in III-II century bc. 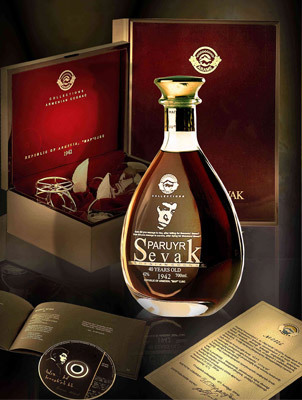 Brandy "Armavir" is made from alcohol and aged in oak barrels for at least 5 years. Gyumri - one of the oldest cities in Armenia. It is a center of arts and crafts. Vintage brandy "Gyumri" - blending of ethyl alcohol, aged in oak barrels 7 years, which is distilled from high quality raw wine grape varieties in Ararat Valley. The king of the ancient Armenian state of Urartu (860-840 BC). He laid the foundation for a strong state in the Armenian Highlands. 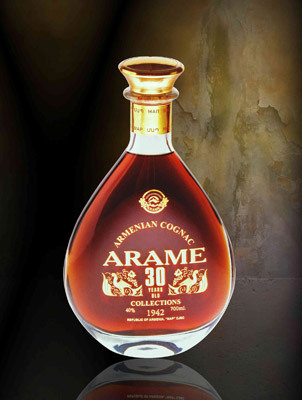 Brandy "Arame" blended from ethyl alcohol, aged in oak barrels for at least 5 years. Natural grape sweet red wine. Made from the grape varieties of the Ararat Valley Saperavi. It has a dark garnet color and a fruity cherry. Pleasant to drink with dessert and fruit. Natural grape semi-dry red wine. Made from the grape varieties of the Ararat Valley Saperavi and Nerkeni. It has a dark garnet color and an attractive fruity cherries. Recommended for dessert and fruit. Natural grape whole red wine. Made from the grape varieties of the Ararat Valley Tigranes. He has a deep red color and fruity taste of cherry. It is recommended to use with meats and vegetables. Natural grape strong wine. 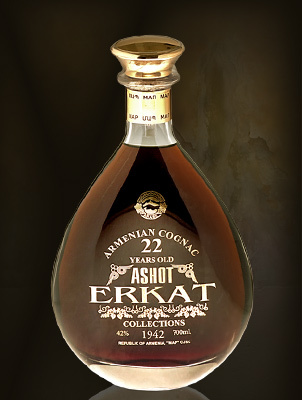 Made from the grape varieties of the Ararat Valley Voskehat, Garan and Dmak Mskhali. It has a dark golden color and a pleasant coffee-chocolate flavor. Pleasant to drink with dessert.